Large spray booths are commonly used to paint trucks, locomotives and boats plus used in many industrial applications. Standard Tools offers a variety of cross-flow, semi-down (a.k.a. modified downdraft) and side-down draft booths. A large truck paint booth is often made in a custom size and has custom features such as an air makeup unit, specific light and door locations and drive-thru doors. Standard size large spray booths are available, but many customers will require custom sizes due to either the available space or the item being coated. 1. Installing a large truck paint booth is a sizable investment. The booth size should allow for potential growth. 2. Large spray booths require support frames that are part of the booth structure. These frames protrude 5” or 7” beyond the outer dimensions of the booth, depending on the span of panels being supported. 3. 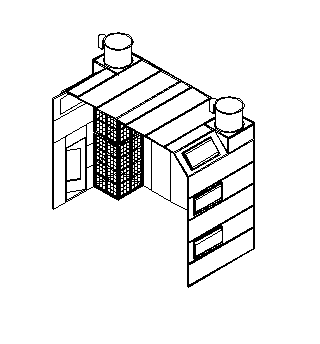 Side-downdraft booths have external exhaust plenums located on the lower side walls. 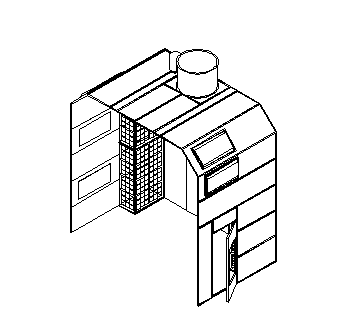 Exhaust fans are typically located on top of the exhaust plenum boxes. The boxes can be made narrower if a higher number of smaller fans is used instead of fewer but larger fans. 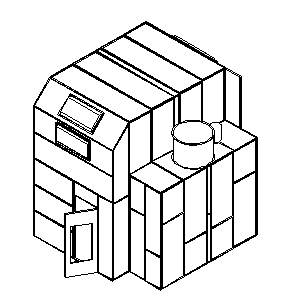 Multiple fans cannot easily be manifolded into common exhaust ductwork. 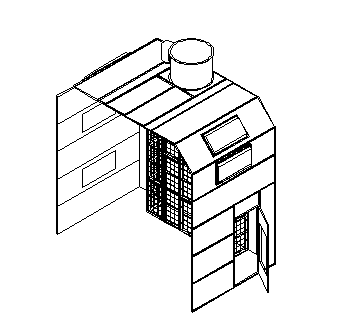 c. Chimneys – Two internal filter chimneys are ventilated by two fans. Manifolding exhaust ducting is not allowed. This is very useful when large exhaust ducting is a problem due to building factors like purlin spacing. d. External Box – Rear wall of the booth is smooth and the exhaust plenum is located outside of the spray area. This options offers a lowered plenum that is useful for low building heights. 5. Front doors require support panels on either side. Generally these panels are 30” wide (making the booth inside width 5-ft greater than the door width). Support panels can be 24” wide for doors less than 14-ft high (making the booth inside width 4-ft greater than the door width). 6. Personnel (or egress) doors are required in every 25-ft radius. Wider booths require more personnel doors than narrow booths due to the radius factor. Conflicts with nearby structures (beams, walls) and the personnel doors should be verified. 7. Spray booth doors can be made in single-style or bi-fold style. The bi-fold is require for door widths greater than 15-feet overall. Bi-fold doors can allow the spray booth to be located closer to walls/doors near the front of the booth. Standard Tools and Equipment excels at custom booth requirements. Design drawings can be completed within a days or so of obtaining all of your requirements. The design will comply with NFPA-33, OSHA, NEC and IFC codes. We currently have custom large booths being used by the US military to refinish helicopters to custom yacht manufacturers applying gelcoat and paint and from large door manufacturers to custom truck shops. The large spray booths can also be designed for powder coating or prep applications. Check out www.paint-booths.com for more information.